Heat oven to 375°F. Pierce each potato with fork. Place directly on oven rack. Bake at 375°F. for 1 hour or until tender. Cool slightly. Line 15x10x1-inch baking pan with foil. Spray foil with nonstick cooking spray. Cut each potato in half lengthwise. Carefully scoop out pulp, leaving 1/4 to 1/2-inch-thick shells; place potato pulp in medium bowl. Place potato shells, skin side down, in sprayed foil-lined pan. To potato pulp in bowl, add milk and Italian seasoning. With potato masher, mash potatoes. Stir in pepperoni and half of the cheese. 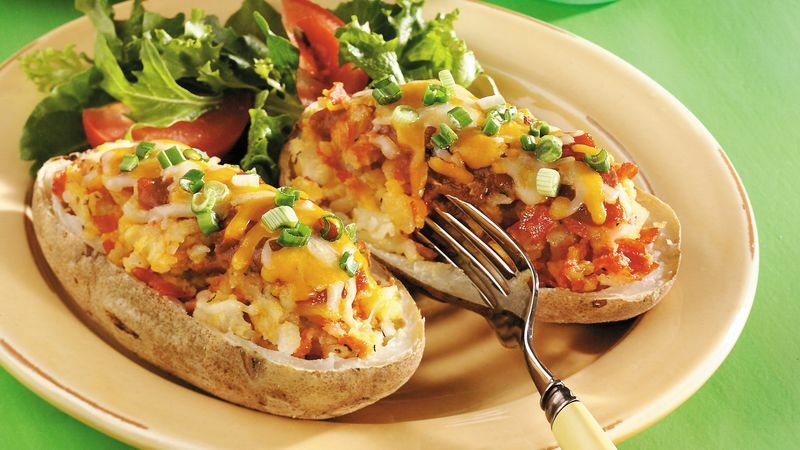 Spoon potato mixture into potato shells. Drizzle each with pizza sauce. Sprinkle with remaining cheese and onions. Bake at 375°F. for 10 to 12 minutes or until thoroughly heated and cheese is melted. If desired, serve with additional warm pizza sauce.